Summer has arrived and so has the heat in San Diego. With temperatures soaring to dangerous levels at any given time this season, the San Diego Sheriff’s Department is reminding the public to take precautions when doing outdoor activities, especially hiking. Since January of this year, Sheriff’s ASTREA, as well as Sheriff’s Search and Rescue (SAR) have responded to 24 incidents of distressed hikers at Three Sisters Falls and Cedar Creek Falls in the East County. In 2016, ASTREA and SAR responded to 51 rescue calls to these areas. These hiking trails are not for beginners. There is no shade from the sun and the return trip is mostly uphill. With extremely steep slopes, a rugged and eroding trail, this hike is listed as strenuous to extreme and is suggested for those in good physical condition. The trail down to Boulder Creek is rated as one of the hardest short hikes in San Diego with approximately a half mile of trail going almost completely vertical. Couple this with extreme summer heat, no shade, and rocky, unstable terrain, and many hikers quickly find themselves overwhelmed and under prepared. Expect little to no cell phone reception in the area. For more information on Three Sisters Falls, visit: https://goo.gl/u4usfo. This 6.6 mile round-trip trail is considered moderate to strenuous, and is recommended for intermediate to advanced hikers. Since the canyon locks in heat, temperatures at the bottom can exceed 110 degrees while ground temperatures have commonly reached 135 during the summer. This trail provides no shade or drinkable water sources, and the trek out is completely uphill. Inexperienced hikers, or those looking to hike the trail for the first time, should not attempt it in the summer or on hot days. 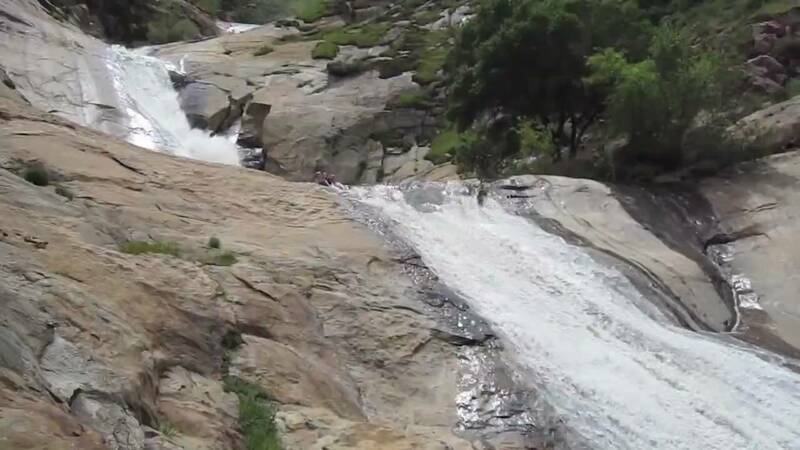 Permits are required to visit Cedar Creek Falls in Ramona. To reserve a permit, visit www.recreation.gov. For more information on Cedar Creek Falls, visit: https://goo.gl/B5b4ka. Also be aware that U.S. Forest Service Rangers and Sheriff’s Deputies will strictly enforce the permit requirements and the ban on alcohol and cliff jumping. They will take appropriate law enforcement actions on violations of local, state and federal laws, which can include a citation up to an arrest and fines. County Ordinance 364.1 also allows for the reimbursement of emergency costs up to $12,000. The Sheriff’s Search and Rescue is an all-volunteer unit. Together, they perform wilderness and urban rescues and search for missing persons. Teams are available 24 hours per day to respond to local, state and federal agency requests. To learn more about SAR, visit www.sdsheriff.net/volunteers. Buddy up – Walk or exercise with a partner. It’s fun and it’s safer. If something happens along the way, you’ll have someone at your side to help. Phone home – Tell someone where you are going and when you expect to return. Your cell phone could provide a necessary connection to emergency assistance. Drink up – stay hydrated before, during and after exercise. You’ll need at least a gallon of water per person during a hike. Avoid caffeine and alcohol. Dress for the heat – wear lightweight, light-colored and breathable clothing. Bring a hat and sunglasses. Wear sunscreen. Take regular breaks – find some shade or a cool place to stop. Leave your dog at home – the trails at Cedar Creek Falls and Three Sisters Falls are not easy on the paws because they are littered with rocks and the surface gets very hot. Head inside – if the heat seems overwhelming, don’t sweat it.